Brandon Ridenour | The Chamber Music Society of Lincoln Center. A virtuoso trumpeter and composer/arranger, Brandon Ridenour is a winner of the 2014 Concert Artist Guild competition and also an International Trumpet Guild solo competition winner. At the age of 20, he became the youngest member ever to join the iconic Canadian Brass, a position he held for seven years. While with the group he recorded ten albums, received three Juno Award nominations, performed on television, appeared on NPR’s Tiny Desk, and played in distinguished venues around the world. As a composer, he has received a Morton Gould ASCAP Young Composer Award and was a recent National Composition Contest winner for the American Composers Forum, resulting in a commissioned piece for the cross-genre string quintet, Sybarite 5. In the recording studio, his latest project, Come Together, features his arrangements of Beatles songs scored for a diverse array of musicians/instruments. Due for release in 2019 to celebrate the 50th anniversary of this Lennon and McCartney classic, the album conveys through music the importance of humanity coming together. 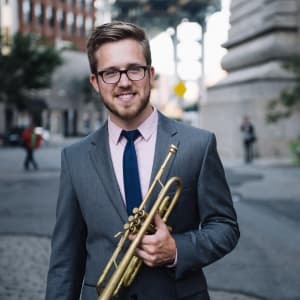 A graduate of The Juilliard School and an ACJW / Ensemble Connect alum, he remains an active trumpet soloist, both in recital and with orchestras. Mr. Ridenour began playing piano under the tutelage of his father, Rich Ridenour, and since then has started two ensembles of his own, Founders and Useful Chamber.